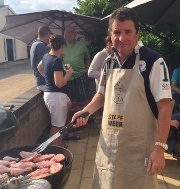 Rae donned an apron and armed himself with tongs to say thank you to his staff at Chestnut Tree Stables yesterday. 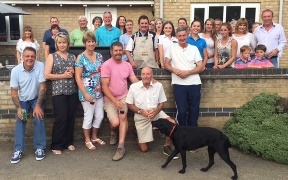 As part of Racing Staff Week Rae treated the team to his culinary skills on the BBQ along with some of our owners and past members of staff. "The stable staff here at Chestnut Tree Stables work very hard to ensure our owners' horses are really well cared for. They work incredibly long hours and take great pride in their work, so it's nice for me to be able to do something to say thank you. I hope they feel they are appreciated because this yard wouldn't run without them" says Rae. "We maybe a small team here but we are a happy one and we have great owners who are very loyal"
Racing Staff Week is a Racing Welfare initiative that aims to raise awareness amongst all those involved in racing, including followers and supporters, about the passion, dedication and talent required to work with racehorses.